The monastery, originally a coenobitic hermitage sanctified in the name of Reverend fathers tortured in Sinai and Raithu, was founded in 1613 by monk Filaret under Tsar Mikhail Feodorovitch. This monk Filaret came from Moscow, where he was a dweller of the Chudov Monastery. Living in that dwelling place, he turned out to be an eyewitness of the martyrdom of St. Patriarch Hermogen cloistered in the monastery. Since this holy hierarch governed once the land of Kazan in the rank of Metropolitan of Kazan and Sviyazhsk, it might be not a chance that monk Filaret appeared in Kazan, where the clergy and laymen have not forgotten yet his archpastoral ministry. Thus, monk Filaret served as the tying link between the patriarch cloistered in the Chudov Monastery and Mitropolitan Ephraim of Kazan, who became the head of the Russian Church after St. Hermogen’s martyred repose. The family of monk Filaret was quite rich. Having got his part of inheritance, he gave it up to beggars, and went to the Moscow Chudov Monastery, where he was tonsured a monk. Some years later, he entered the community of the Kazan Savior’s Transfiguration Monastery. 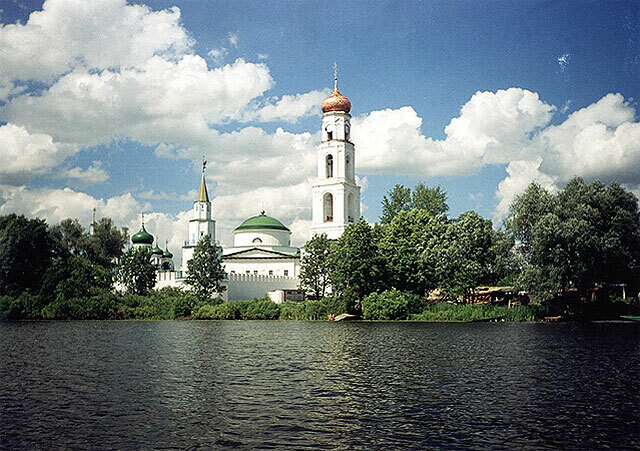 The worldly clamor of the city of Kazan, which disturbed peace of the monastic life, made Filaret seek solitude in the forests, which surrounded Kazan. One time, he found himself in a place amidst the forest, on the shore of a picturesque lake. He was charmed with the view of this place, which location was quite convenient for a hermit. There he built for himself a squalid hut. At first the monk’s cell stood in a completely solitude broken sometimes by the Cheremiss tribes, who came there to commit their pagan rites. But soon the place, where the monk lived fasting and praying, became known among the Kazan citizens, who venerated him and started visiting him in the wood. Some of them made up their minds to devote their lives to monastic exploits and settled nearby. This way was led a foundation for the monastic skete on the shore of a beautiful lake. The Holy Trinity Cathedral was built by design of architect F.N. Malinovsky. The temple was famous for its remarkable acoustics, so that the singing of four monks on the church gallery one could hear in the distance of two versts (7, 000 feet) from the monastery. The monastery was closed in 1928. A parish community headed by Hieromonk Iosif was placed there for one year and a half until on January 27, 1930, the commemoration day of Reverend fathers tortured in Sinai and Raithu, all monks of the monastery together with the nuns and laymen, gathered in the church in order to celebrate the patron saint’s day were arrested. Six dwellers of the Raifa Monastery, among them hieromonks Iosif, Sergy, Antony, Varlaam, Iov, and a novice Peter were martyred, the others exiled to forced labor camps. 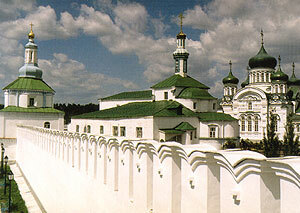 The Raifa Monastery was the first of the cloisters existed in the Kazan diocese before the revolution, which was returned to the Russian Orthodox Church in early 1991. With the blessing of Bishop Anastassy of Kazan and Mari (now archbishop of Kazan and Tatarstan), hieroarchimandrite of the Raifa hermitage, restoration works began. Superior of the monastery was appointed Hegumen Vsevolod (Zakharov) (now archimandrite). On August 14, 1991 the miracle-working image of the Mother of God of Georgia was translated to the holy abode, the first Divine Service was performed, so as the Church of the Georgian Mother of God was consecrated. 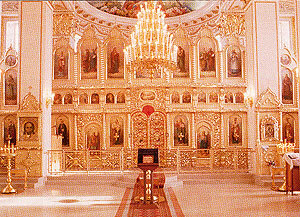 On June 2, 1996 there was sanctified the last one of the three restored temples – the Holy Trinity church. On April 6, 1997 in the presence of multitudes of believers there took place a ceremony of canonization of new monastic martyrs of Raifa slain in 1930. The main shrine of the Raifa Monastery is the miracle-working icon of the Mother of God of Georgia (a copy made from the Krasnogorsky image). The history of the icon is as following. In 1622 the Persian shah Habbas subjugated Georgia and captured a lot of trophies to sell them to Russian mershants, who used to come on business to Iran. The Georgian icon of the Mother of God was captured along with other valuable things. It was splendidly decorated with gold and silver. In 1625 a tradesman from Persia offered the icon to Stephan Lazarev, who was a shop assistant of the tradesman from Yaroslavl called Yegor Lytkin. Stephan willingly bought the icon and a short time after he kept it at his place. At the same time, while dreaming, Yegor Lytkin was shown the image and told to bring the icon to the Krasnogorsky Monastery, which was founded in 1603 at the Pinega River in the diocese of Archangelsk. 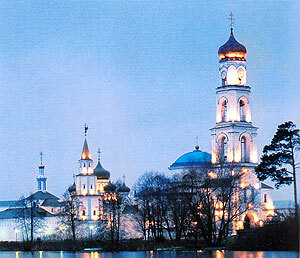 However, Yegor forgot his dream for some years, until Stephan came back to Yaroslavl in 1629. When Stephan presented the icon to his master, he recollected the revelation. He decided to fulfill the order given him that time, and immediately brought the icon to the monastery of Tchernogorsk, which took its name after the gloomy forests in the darken mountainous place known as “Black mountains” where the monastery was situated. Later on its name was changed into “Krasnogorsky” (“red hills”). By the middle of the 17th century, the Georgian icon became the object of worship, as it was considered the miracle-working one. Metropolitan of Novgorod Nikon (later on the patriarch) investigated all the facts about the miracles happened from this image and set in 1650 the celebration of the Georgian icon of the Mother of God on August 22 (September 4 Gregorian calendar). Metropolitan Lavrenty of Kazan, who had been the hegumen of the Vazhsky Monastery situated near the Krasnogorsky cloister, sent the best icon-painter to make an exact copy of the Georgian icon of the Mother of God. The copy was brought by a solemn procession, carrying crosses and banners, with Metropolitan Lavrenty himself as the head of it. Very soon, the copy of the holy image of Raifa became famous for its miracle-workings. The annual procession of carrying the image to Sviyazhsk was fixed on July 31. 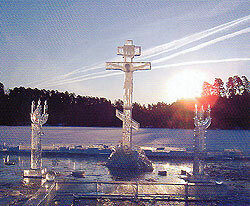 Within 20 days the icon is to be placed by turn at every parish church and monastery of Sviyazhsk. The Church in honor of SS. Reverend Fathers tortured in Sinai and Raithu was erected instead of the first wooden temple and consecrated in 1708. Later on the church was reconstructed by designs of architects A.G. Nevinsky (1892) and N.F. Malinovsky (1897). 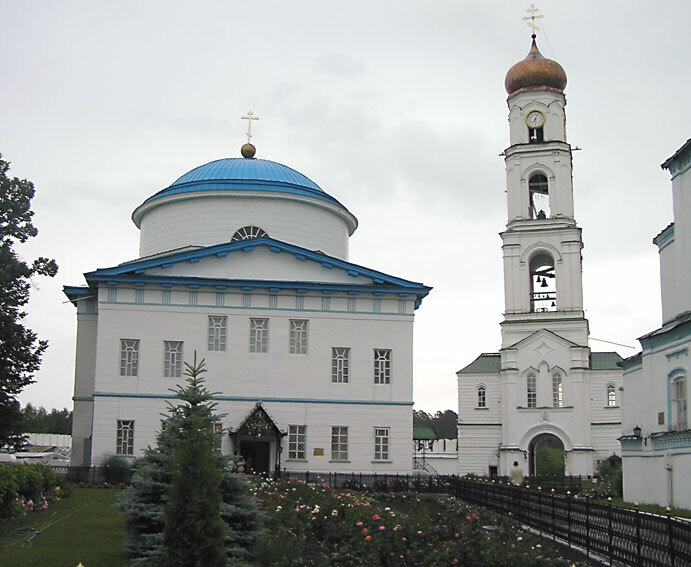 After the Raifa Monastery was returned to the Russian Church, it was consecrated for the second time on September 4, 1992. Behind the church above the southern monastery wall, there rises at the lake’s shore a lonely chapel, the only saved one, which restoration works finished in 1998. The latest constructions of the monastery were the bell-tower, the over-the-gate Church of Archangel Michael and the Trinity Cathedral. The construction of the bell-tower started in 1889 due to the sponsorship of the well-known Kazan benefactor Mikhail Timofeevich Atlashkin. The legend runs that before constructing the chapel the monks saw some special omens of benediction given by Lord. One of the monks saw a blessing palm from behind a light cloud above the place chosen for building of a chapel. The others heard the bell, which started ringing at the same time. 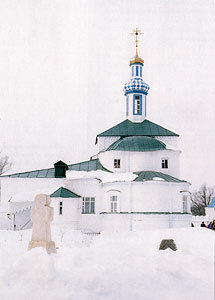 When Filaret died (approximately in 1659), he was buried at the Monastery of the Savior’s Transfiguration. It was the monk Faddey, who on behalf of the hermitages’ brethren applied to Metropolitan Lavrenty of Kazan and Sviyazhsk for blessing to foundation of the monastery. Lavrenty granted a blessing to such a benefaction and sent Hieromonk Savvaty, a very experienced one in construction works, to raise a holy tabernacle. In 1662 the earliest wooden church was built. 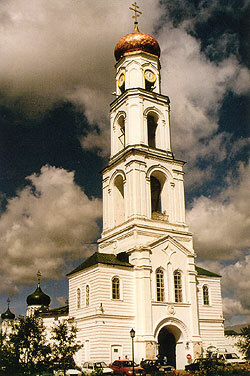 It was consecrated in honor of St. Evfimy, the archbishop of Novgorod. At the same time, the fence and two gateway churches were being erected. One of them, consecrated in honor of SS. Reverend Fathers tortured in Sinai and Raithu, gave its name to the hermitage of Raifa. The earliest temples of the monastery of Raifa were consecrated under the Metropolitan Lavernty. 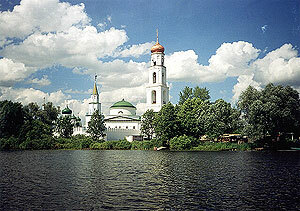 Owing to the Hegumen Savvaty’s petition he sent to Tsar Alexey Mikhailovich, the Monastery of Raifa was granted a plot of land on the riverside of Kama in 1670. The estate of the monastery started increasing with forests, meadows and arable lands. Unfortunately, the fire of 1689 destroyed all the buildings and utensils. After the disaster the monastery shipped into extreme poverty. Nevertheless, it recovered and gradually became prosperous only due to the care of the ruling Archbishop Adrian of Kazan (the future Patriarch of Moscow and All Russia), and hierarchs Markell and Tikhon III. According to the Kazan Eparchial Register of 1739, on the territory of the holy abode there were 15 temples including side-chapels. 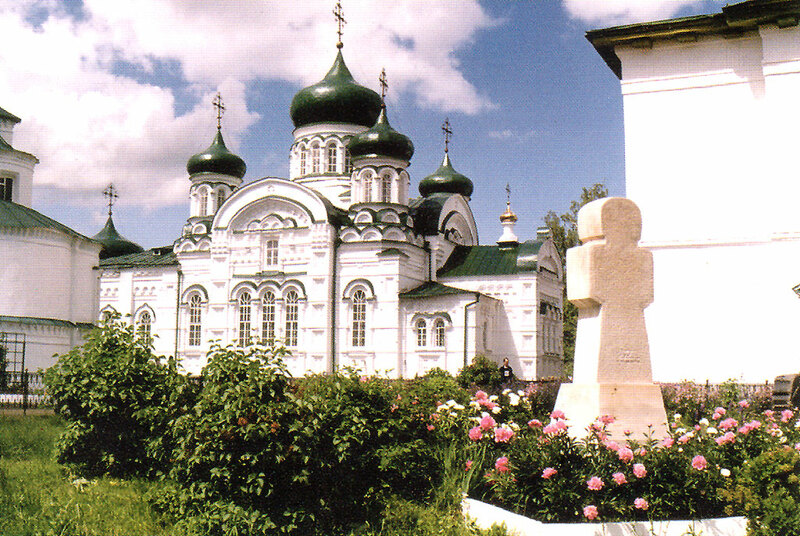 Nearly each church was provided with contributions made by the Metropolitan Tikhon and the wealthy citizens of Kazan. In 1842, under Archbisop Filaret (Amfiteatrov), the old temple was replaced with a new one erected by design of architect M.P. Korinfsky. The latest constructions of the monastery were the bell-tower, the over-the-gate Church of Archangel Michael and the Trinity Cathedral. The construction of the bell-tower started in 1889 due to the sponsorship of the well-known Kazan benefactor Mikhail Timofeevich Atlashkin (died in 1901 and buried on the monastery cemetery). The legend goes that one day Hegumen Veniamin was going to reconstruct the tower, but he had doubts about such a serious undertaking as he had neither money not materials required. Not having anyone to address for a counsel, he decided to consult about the problem with a child, whom he accidentally would meet in the street. So, he left the cloister, walked about a kilometer and saw a woman with a little girl. When they approached, the priest blessed them and asked the girl’s name. She said her name was Masha. When the hegumen asked Masha (Maria) about her age, to his great surprise the girl said she was about 30 million years old. But the girl’s mother said the child was about four years old. The hegumen asked Masha whether he should or should not build the bell-tower. — Yes, build it, — she said. The elder blessed the child and returned to the monastery. On the same day he gave orders that the workers had to be employed, and the scaffoldings and instrumentals prepared. The next day merchant Mikhail Atlashkin arrived the monastery and told the hegumen that he was going to make a donation of one million bricks to the monastery, but was afraid, whether it would be an appropriate gift at the moment. The hegumen was surprised. “Yes, we have just decided to raise the bell-tower and we need a lot of bricks”. The same day Atlashkin started to supply the bricks. On September 14, 1891 on the celebration of the Exaltation of the Life-Giving Cross the new belfry was crowned with the cross. 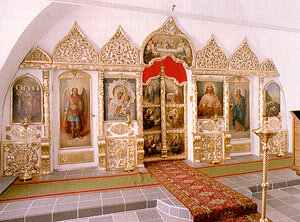 In 1903 the altar of the church over the gates was consecrated in honor of the Archangel Michael, the heavenly patron of merchant Mikhail Atlashkin. the prominent public and political figures, and for the workers of the Russian culture. 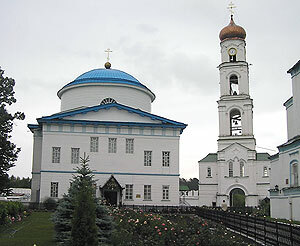 Nowadays, the Raifa Monastery is the largest in the Kazan diocese. Superior: Archimandrite Vsevolod (Zakharov). 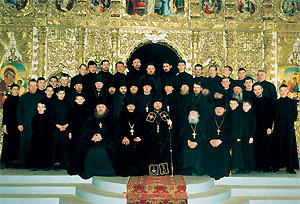 Dwellers: Shema-hegumen Andrey (Shiryaev) – treasury; Shema-hegumen Sergy (Zlatoustov), hieromonk Iov (Miledin), hieromonk Mark (Gogiashvilli), hieromonk Anthony (Pan’kin), hieromonk Daniil (Domnin), hieromonk Vladimir (Ovchinnikov), hieromonk Ignaty (Petrov), hieromonk Ilia (Petryakov), Fr. 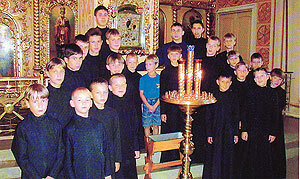 Sergy Osipov, hierodeacon Grigory, hierodeacon David (Adambekov), hierodeacon Onisim (Senyushin), hierodeacon Vladimir (Kayurov), hierodeacon Arseny (Mazanov), deacon Kirill Nazarov, monk Ioann(Chernov), rassaphore monk Alexander (Temiraev), rassaphore monk Anatoly (Toporov).